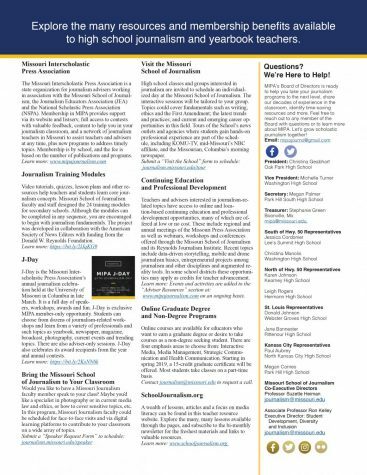 Thank you for joining MIPA, the oldest official state journalism group for Missouri associated with the Missouri School of Journalism. Use this link to complete the Membership form for the 2018-2019 school year. The preferred method is to complete the online form; however, we know some school districts need digital or hard copies, so feel free to print the pages you need from the browser window. We can accept POs, send an invoice or accept a check. If you need other methods of payment, please email [email protected] with questions. 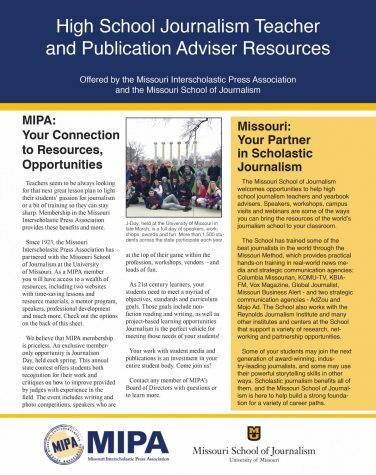 Membership in MIPA provides support via our website and listserv, full access to contests without additional fees, content to help you in your Journalism classroom, and a network of Journalism teachers in Missouri to assist you at any time, plus several new programs this year. We also hope you and your students will attend our annual Journalism Day held at the University of Missouri – Columbia on Monday, March 25, 2019. Additionally, we encourage our members to consider joining the Journalism Education Association, too. They provide even more resources on a national level. By combining JEA with your MIPA membership, you help MIPA earn reward dollars for our local association. You can find more information about the benefits of MIPA in new benefits flyer.